Cherry blossoms in D.C.– or one more item off from the ol’bucket list (with comparisons to S. Korea) – Rebecca Radnor's Personal Blog: Consider yourselves warned! This feeling of a deficit in my lifetime experience is even more odd when you consider that I’ve lived in Korea for two and a half years; not only that, but I was working (as a professor) at the Kyung Hee University Campus in Seoul, which is renowened as one of the best cherry blossom viewing locations in the city. Not to mention I made regular visits to the Lotte World Amusement park (World’s largest indoor theme park (and yes, of course I had a season pass), which is one of the other “go to” viewing locations in Seoul during the few fleetings days of Cherry Blossom season. Just like DisneyWorld’s Magic Kingdom, Lotte World sits alongside a man made lake, around which are planted a massive quantity of Cherry trees. While there is an entrance fee to the section of the Lotte park where the rides are, pedestrians are free take the path that circles the lake, making this another favorite spot for the residents of Seoul to enjoy the cherry blossoms. While I won’t go into it here at length, but every time I entered Lotte World I was always wondered how Lotte managed to NOT get sued by Disney for infringment (the extent to which the former is almost a mirror image of the latter is almost laughable); but, I ultimately decided that the sheer size of the Lotte corporation — or to use the Korean term, Chaebol — which is a multinational in it’s own right just like Disney, probably has a lot to do with their immunity from Disney’s legal team. For some reason, as I was in Korea and I regularly walked to work along paths that quite litterally rained cherry blossoms on my head…. 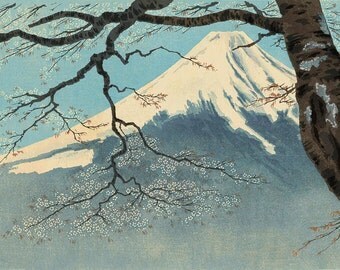 those trees never looked “quite right” to me, as they were willowy, and looked more like regular cherry trees, rather than the thickly gnarled wood and blossom heavy branches that hung with twisted beauty, as depicted in Japanese paintings. And therefore, these Korean trees never filled my personal need in me to see that beauty in the real world. Can we say Global Climate change? This last winter while I was in Florida, avoiding normal “cold” of Chicago’s winter, and the the folks back home were busy playing golf in Feburary, and walking around in shorts… while we snowbirds down in Florida had maybe one or two days that actually made it into the low 70’s. Washington D.C. was also uncharacteristically warm, so that friends of mine who had to be there for work in late Febuary were commenting on how trees were already starting to blossom, and everyone was talking about how the cherry blossom season was most likely going to be over a month early this year. ARGH!!!! The weather gods were however on my side, and early March brought with it a dive in the tempretures and a late nor’easter complete with snow, followed by alternating warm and freezing days, so that the risk then became that of the cold damaging the blossoms that had started to bud too early. Teaism is a teashop/resturant chain with three locations in the D.C. area, and rotating seasonal menus, that offers up popular and highly affordable dishes. The one I went to was in Penn Quarter and proved to be very tasty. Posted on March 22, 2017 May 2, 2018 by japladyPosted in Amusement/Entertainment Parks, Bucket list, Destination Cities and Towns, Mother Nature, Resturant Reviews, Tourist AttractionsTagged @Seoul_S.Korea, @South Korea, @Washington_D.C._MetroArea.